The Joffrey Ballet is such a prestigious name in the international dance world that it’s bound to be surprising to most film audiences to find out about its melodramatic—and quite peripatetic—existence. Since its inception in 1956, the company has had more ups and downs than an elevator powered by an automated trampoline. Veteran documentarian Bob Hercules has found an ideal subject to follow up on his successful depiction of choreographer and dancer Bill T. Jones, A Good Man. Like Jones, the duo of Robert Joffrey and Gerald Arpino were artists obsessed with the intricacies of dance—so motivated that they had to form their own troupe. Documenting dance, as Hercules has already discovered, is a challenge, but when done with a proper appreciation for the art of choreography, the rewards are vast. Leaving the camera in mid-range for enough time for a dance to unfold is the way to go—and that’s what Hercules does, even when he’s presenting archival material. But let’s not forget the melodrama. When the company was formed in the mid-‘50s, Joffrey could only hire six dancers. Either Joffrey did the choreography or his life partner Arpino did it; both were trained as classical dancers. At first, Joffrey couldn’t even tour with his dancers; he had to work in New York to pay for his company to travel. But by the early ‘60s, a patron, Rebekah Harkness, started supporting them in grand style. The company toured the Soviet Union and entertained Jackie Kennedy and JFK at the White House. Unhinged by success, Harkness attempted to take over the company but Joffrey vociferously resisted. The wealthy Ms. Harkness hired away most of the original ballet company and started her own organization, which lasted a decade before failing amid a mountain of debts. Meanwhile, Joffrey and Arpino scouted and assembled a new group of dancers and embarked on the company’s most successful decade. 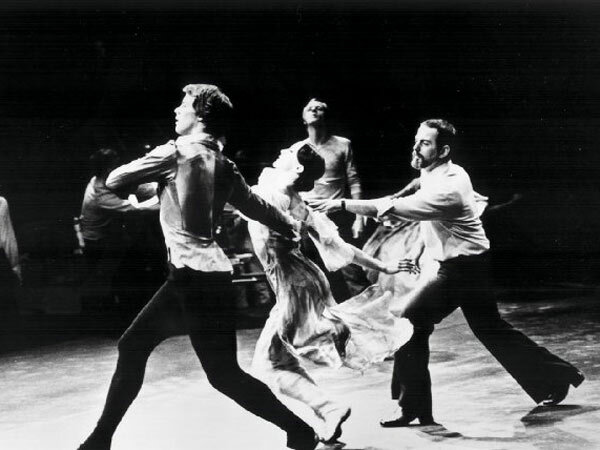 From the mid-60s to the late ‘70s, the Joffrey was one of the most exciting dance organizations in the world. Hiring colour blind, the Joffrey assembled a group of dancers from a multitude of ethnic backgrounds—and various sizes and shapes. Joffrey’s multi-media piece Astarte thrust the company onto the cover of Life Magazine.